With a huge library of titles, Apple pushed the iPod touch and iPhone as the definitive mobile gaming platform Wednesday as it announced a new 64GB iPod touch priced at $399. In addition, a 32GB offering will be available for $299, and an 8GB option for $199. Apple executive Phil Schiller noted that the $199 is a "magic price point," so the 8GB option with lower component costs was used to hit that pricing sweet spot. "At just $199 the iPod touch is the most affordable gateway to Apple's revolutionary App Store with more than 75,000 applications that you can wirelessly download right into your iPod touch," said Schiller, Apple's senior vice president of Worldwide Product Marketing. "You get a great iPod, a great pocket computer with the industry's best mobile web browser and a great game player, all in this super-thin beautiful enclosure." The 32GB and 64GB models will have the ability to run Open GL ES 2.0, and have up to 50 percent faster performance. Reusing last year's tagline, the iPod touch is dubbed "The funnest iPod ever." Apple highlighted a number of high-profile upcoming releases, including Aassassin's Creed 2 (a sidescroller from Ubisoft), Riddim Ribbon (a rhythm game from Tapulous), Nova (a first-person shooter from Gameloft), and one of gaming's largest franchises: Madden NFL 2010 from Electronic Arts. In its presentation, Apple boasted that the iPhone OS has 21,178 game and entertainment titles available, while the Nintendo DS offers 3,680 and the Sony PSP only 607. In addition, Schiller noted that titles on competing platforms cost between $25 and $40, compared with many budget-priced titles available on the iPod touch and iPhone. 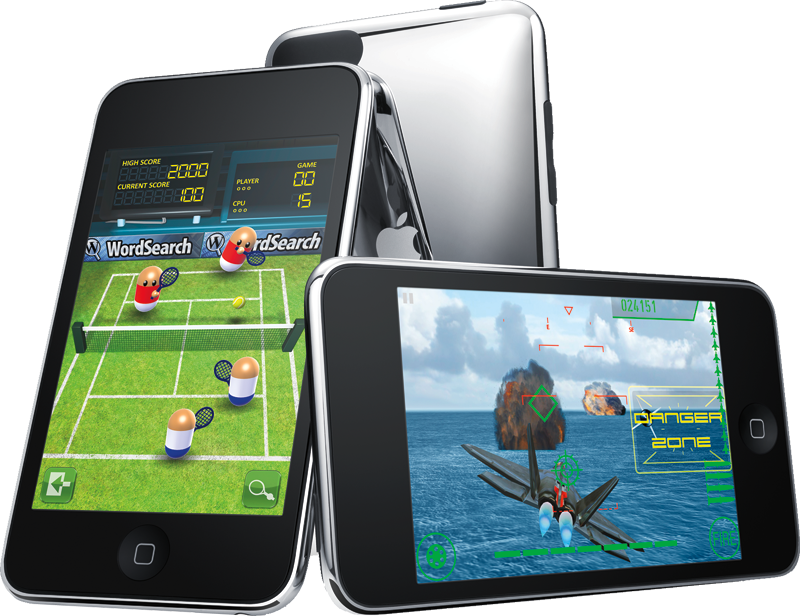 Schiller noted that the iPhone OS is the only mobile gaming platform to offer a multi-touch interface, the ease of purchase via the App Store, and the inclusion of iPod multimedia functionality. The presentation also pushed the iPod touch as a "pocket computer." Touting the device's ability to surf the Web, check e-mail, manage calendars, organize contacts, and access popular Web sites like Facebook and Twitter, Apple also unveiled iPhone OS 3.1 for the device, bringing App Store recommendations. The lack of a camera on the new iPod touch is surprising, as third-party cases for months have shown a camera hole on the device. But as reported by AppleInsider days ago, it is believed that hardware issues with the camera caused the capability to be scrapped.